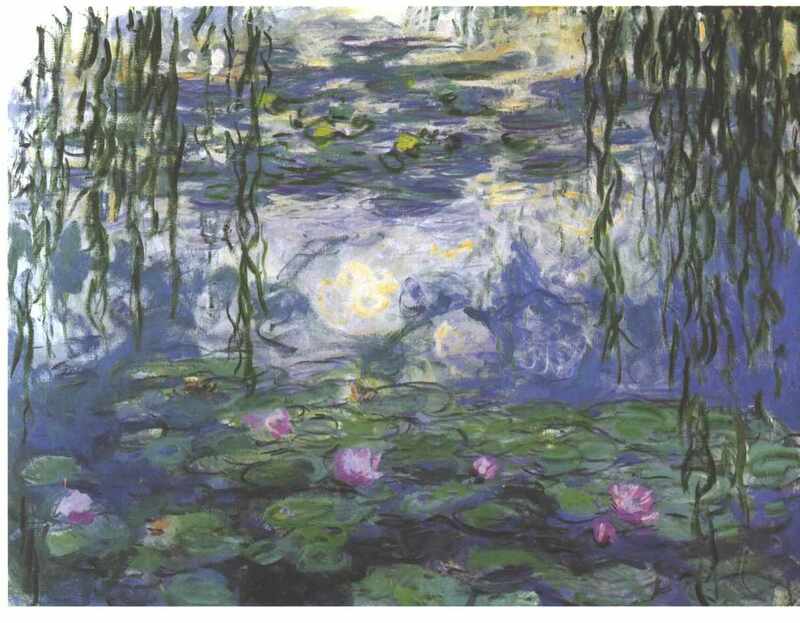 Monet is regarded as central to the Impressionist movement in that he followed the philosophy and principles of Impressionism all his career. Monet painted much of his works Plein Air ( outside looking directly at the subject) and was concerned with how the colour of things changed in different weather and atmosphere. “ Color is my day-long obsession, joy and torment! ” . Claude Monet was born in Paris but grew up in Le Harvre where he was influenced by the artist Eugéne Boudin who encouraged him to take up Plein Air painting. In 1862, after a spell in the French Army, Monet began to study art under Charles Gleyre in Paris. It was in Paris that he met other artists such as Renoir and Pissaro who had similar interests in colour, light and brushstokes as him, it was these artists who would go on to form the ”Impressionists”. 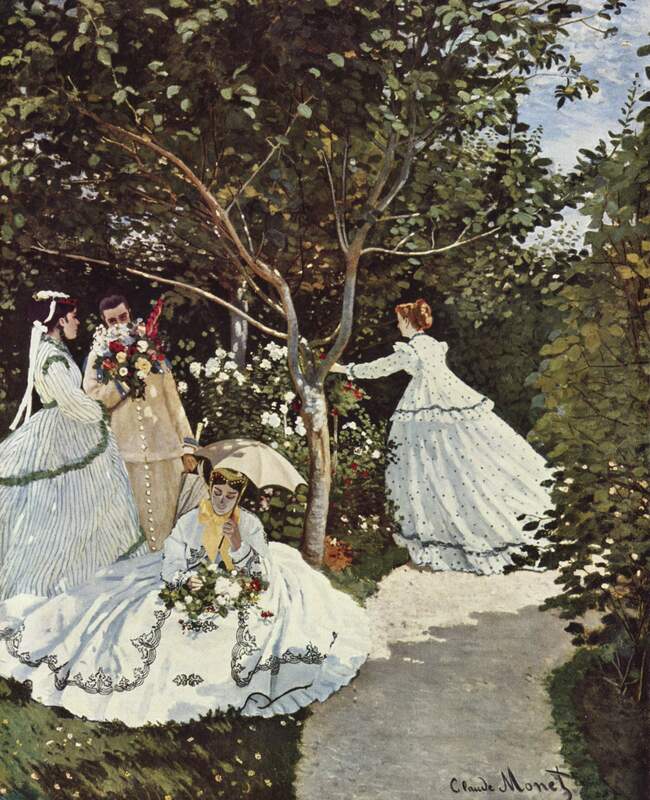 “Women in the Garden” 1866/67 was painted ourdoors by the young Monet. The painting was so large he had to dig a trench so that the painting could be lowered for him to reach it. 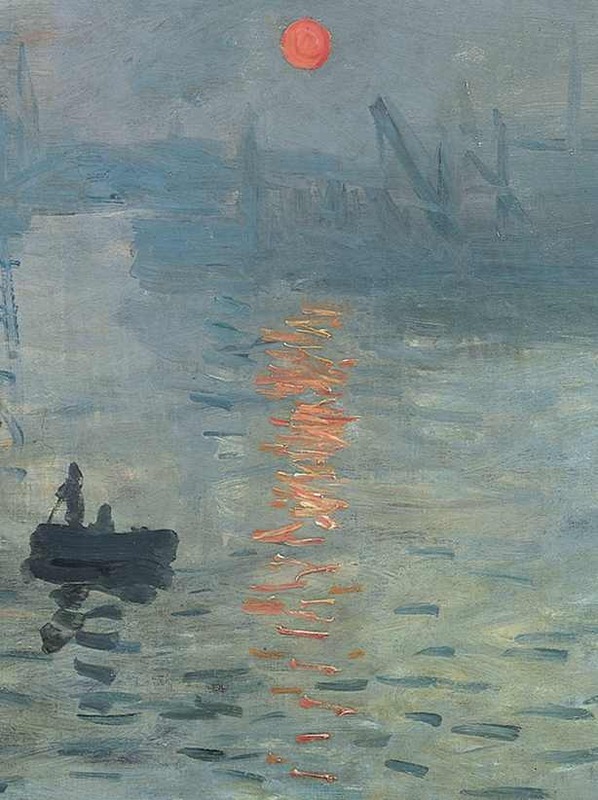 Monet’s concern for the effects of light and shadow is quite visible in this early painting. The bold brushwork which is always a feature of his work is already there at this early stage in his career. Claude Monet, Women in the Garden 1866-7. The effect of light and shade can be seen particularly in pale areas such as the womens’ dresses, the umbrella and on the path. Exhibition. 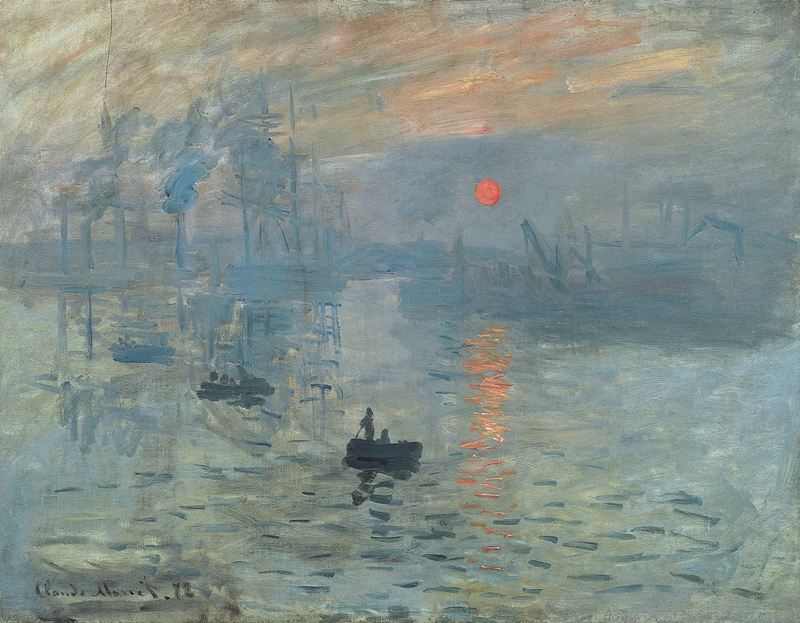 The art critics reacted strongly to this painting because it was an “ Impression’ rather than an exact painting of a harbour at sunrise. One critic – Louis Leroy wrote that all the paintings in the exhibition were ‘Impressions” and the name stuck. This is how Impressionism came to be. The painting is of the harbour at Le Havre at dawn. It appears to be foggy. Monet uses mostly blues except for orange which he uses on the sun,an orange tint in the clouds and the orange reflections of the sun in the water. As the title suggests he captures an impression of the scene rather than painting in the exact details. Detail of Impression ;Sunrise. 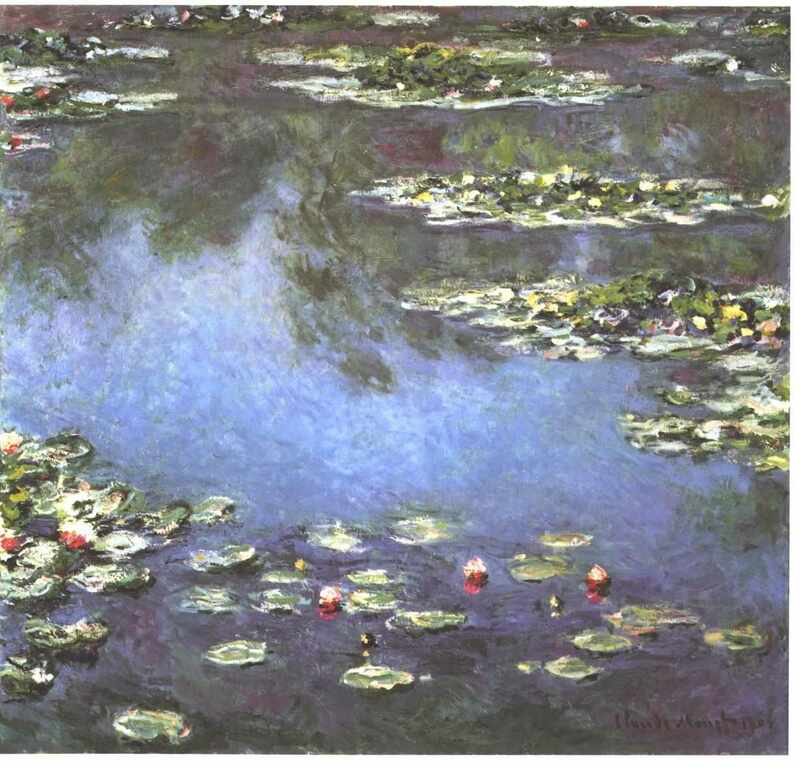 You can see how thickly Monet has applied the paint in the reflections of the sun on the water. 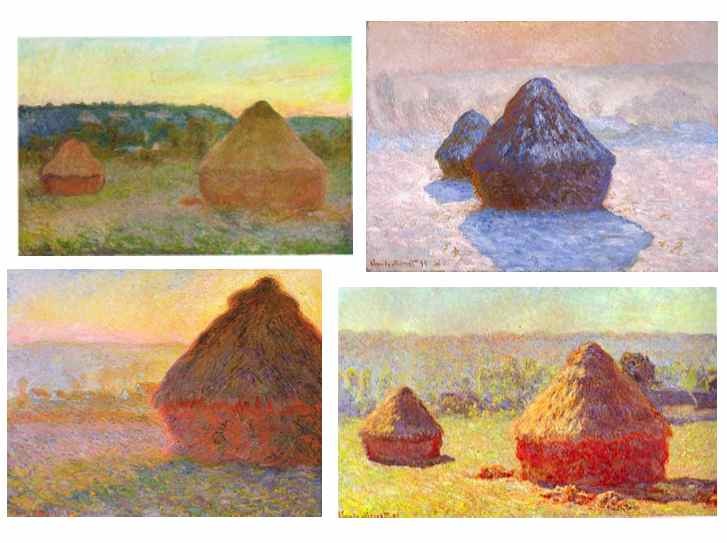 Monet uses orange and white -side by side -and mixes them on the canvas. 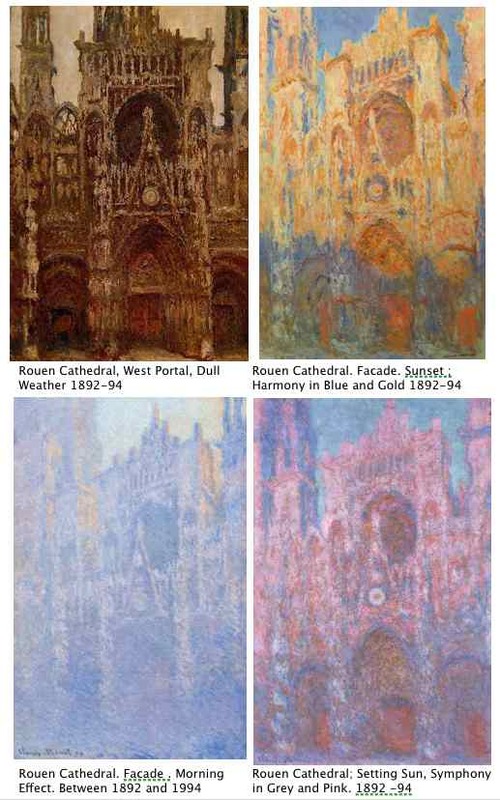 From the 1880’s onwards Monet began to paint in series – he took a subject matter and painted a series of it – over and over , in different lighting and weather conditions.The most famous of these series are his paintings of Rouen Cathedral ( below) and of haystacks ( further below). 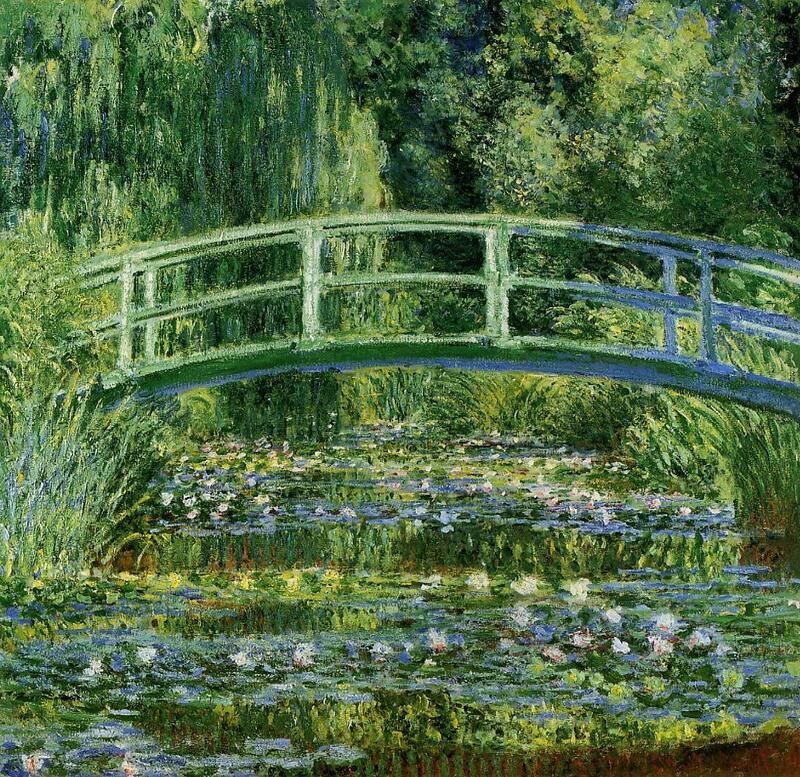 In 1890 Claude Monet bought a house and land in Giverny. He built a magnificent garden there and spent the rest of his life living there until his death in 1926. 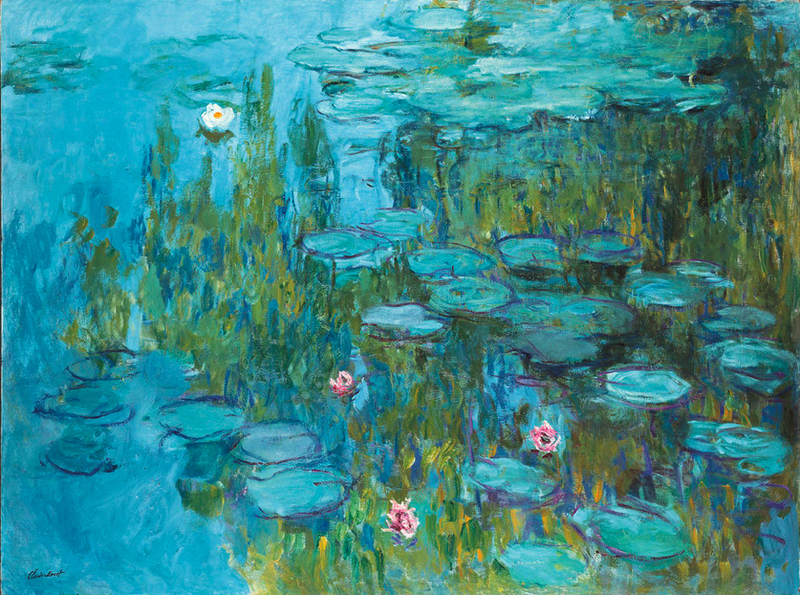 He painted scenes from his garden – the pond and bridge, flowers, trees and his most famous series of waterlilies. At the end of his life Monet’s paintings became more and more abstract – he was always concerned with capturing an impression and as he aged his sight began to fail; Monet’s painting took on an abstract appearance where colourful marks and brushstrokes dominate the viewers senses. At times its difficult to make out what the painting is about – the viewer needs to step back and appreciate the impression and mood that Monet is creating.